This is Part 2 in our series, A Primer on Asset Protection Law. In Part 1, we discussed asset protection in the business context. In the coming weeks, we will address other aspects of asset protection law for individuals and families in a variety of circumstances. Sometimes our conversations about asset protection focus too much on business owners and/or those who have accumulated substantial wealth. (And of course, there are unique asset protection needs and planning options for these circumstances). However, planning for the possibility of long-term nursing home care expenses is another important area of asset protection to consider. This will be the context of our asset protection discussion today. For many of us, the costs of nursing home care can quickly eat through our entire life savings. Certainly, as we age, the likelihood of needing professional nursing-home care increases. But the reality is that unexpected circumstances can occur at any time that may end with a need for skilled nursing home care. With average nursing home costs nearing $85,000 per year, determining how to pay for this type of care is an important issue for almost everybody. Those with great wealth may be able to pay these expenses without significantly impacting the size of their overall estate. But for most of us with more modest means, careful planning can often allows us to preserve access to nursing home care when needed, without unnecessarily sacrificing all family assets to pay for that care. As is often the case in asset protection planning, good insurance can be the first line of defense against unnecessarily spending modest family assets on nursing home care. Ordinary health insurance generally does not cover the cost of nursing home care, but healthy individuals can often buy long-term care insurance that will. Depending on your current age and health, purchasing for this type of insurance may or may not make financial sense. Making this determination often involves a discussion with your financial advisor and/or insurance agent. If you are healthy, but worried about how you will pay for nursing home care in the future, this is a conversation you should have right now. Those who can demonstrate both a medical and an economic need for assistance with nursing home care can often obtain public assistance through the federal Medicaid program. Note: In Arizona, Medicaid is administered through the Arizona Health Care Cost Containment System (AHCCCS, often pronounced “access”, and long-term care within AHCCCS is administered through the Arizona Long Term Care System (“ALTCS”, often pronounced “all-teks”). Determining financial eligibility for ALTCS coverage can sometimes be very complex. The general rule in Arizona is that an individual qualifying for ALTCS must have less than $2,000 in countable assets and less than $2,250 in monthly income. Individuals on the verge of qualifying may be tempted to transfer funds or assets to loved ones in order to ensure that they qualify for ALTCS coverage as soon as possible. In many cases, these types of transfers can lead to a “penalty period” that will further delay your eligibility for ALTCS coverage. Accordingly, it is important to understand the detailed rules in determining which assets or income sources are “countable” as well as what types of transfers are permitted without incurring a penalty period. The best way to play for these situations is to work with a qualified attorney who understands the rules and can assist you with any necessary planning techniques that will allow you to qualify for ALTCS coverage. In many cases, one spouse requires nursing-level care—either in a dedicated nursing home facility or via professional in-home care—while the other spouse is still relatively healthy. (In ALTCS jargon the healthy spouse is referred to as the “community spouse.” Other experts may refer to this spouse as the “well spouse”). In these scenarios, ALTCS may allow a potential ALTCS customer to qualify for ALTCS even when the family has more than the above-referenced $2,000 in assets and $2,250 in monthly income. In some cases, transfers of assets or income streams between spouses can be permitted without triggering penalty periods—allowing the ALTCS customer to receive the nursing-level care he or she needs, while the healthy spouse can continue to use family assets for his or her own needs. ALTCS rules also make special allowances for potential customers with children and/or dependents with special needs. In many cases, assets can be transferred to these dependents without creating a penalty period. In some cases, assets can be held by the ALTCS customer if they are being held for the benefit of a special needs child or dependent. (Often this type of planning will include the creation of one or more trusts. More on that will be discussed below). Families who may be preparing for ALTCS eligibility in the near future need to be careful about transferring funds or incurring large expenses. In order to determine eligibility, ALTCS will review transactions that took place during the last five years in order to determine whether they should apply a penalty period. Transferring funds to others or incurring expenses on behalf of others will lead to a penalty period. Furthermore, purchasing expensive assets that will be counted as available resources when determining eligibility for ALTCS will delay eligibility. can be a helpful way to protect modest resources and maintain eligibility for ALTCS. For example, ALTCS will not include the value of an individual’s primary residence or car when determining eligibility for ALTCS. Other “non-countable” assets include pre-paid burial plans, burial plots, qualified life insurance plans (worth less than $1,500) and personal effects, , Accordingly, potential ATLCS customers can safely make improvements on the family home or replace their automobile, or buy a new couch without fearing that the increased value of these assets will interfere with their eligibility for ALTCS. Trust and gift planning can also be an important component of asset protection planning as we prepare for mounting nursing home costs. Those who intend to qualify for ALTCS coverage may opt to make gifts of funds to their loved ones well in advance of their application for ALTCS so that those transfers occur outside of the normal five-year “look back” period. Gifts and transfers made more than five years before an ATLCS application are generally not subject to a penalty period. Sometimes these gifts are transferred into one or more qualifying trusts. If the intended ALTCS customer is not a beneficiary of this trust and does not retain other prohibited interest in the trust, the assets can be maintained for the benefit of other family members. Sometimes the ALTCS customer is the intended beneficiary of a gift or inheritance from another loved one. In these cases, the sudden (but often non-sustainable) inheritance will often disqualify the ALTCS customer from coverage. To avoid this result, the donor of the gift can create what is commonly referred to as a “Special Needs Trust.” If this trust is created in accordance with the ALTCS rules, the funds in the trust are not “countable resources” for ALTCS purposes but may be made available to pay for certain medical costs or other expenses not covered by ALTCS. For certain veterans and their spouses, Veterans Affairs (VA) Pension benefits may be available to help pay for medical expenses and/or nursing home costs. IMPORTANT NOTE: VA Pension benefits are separate from VA Disability Compensation. Those who were injured in the line of duty may already be receiving VA Disability Compensation. Others may have applied for disability compensation and were denied. The VA Pension planning discussed here is separate and distinct from VA Disability Compensation. Having served in the U.S. Military (or be the spouse of an individual who served) for at least 90 days in active duty where at least one of those days was during an *eligible wartime period. *Eligible wartime periods include World War I, World War II, the Korean Conflict, the Vietnam Conflict, and the ongoing Gulf War conflict which began August 2, 1990). Like ALTCS, qualifying for VA Pension benefits requires showing both medical and financial need. Unlike ALTCS, there is currently no clear and defined threshold regarding the level of assets a person may have while still qualifying for VA Pension benefits. Instead, the VA will make a case-by-base evaluation of an individual’s actual medical costs compared to that individual’s income and available assets. Many of the same planning approaches described above can also be used in planning for VA Pension benefits, although there are a few key differences in specific techniques. For example, the VA does not currently impose a penalty period if a potential pension beneficiary transfers assets to someone else. This often means that even after transferring funds, a person can qualify for VA immediately while engaging in more advanced planning and waiting to apply for ALTCS in the future. Of course, the specific planning needs for each individual will vary based on unique circumstances. 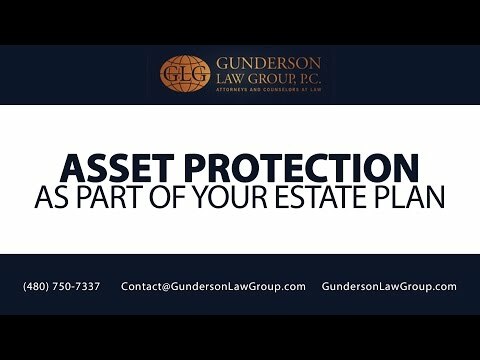 If you have specific questions or concerns about asset protection issues for you or your business or your loved ones, please contact the attorneys at the Gunderson Law Group, P.C. in Mesa, Arizona. We serve clients in Mesa, Phoenix, Tempe, Chandler, Gilbert, Scottsdale, as well as throughout the state of Arizona, Nevada, and throughout the world.